Scar-Tail is an Argonian assassin who is hiding out after a failed assassination attempt at the Bogwater camp southeast of Leyawiin. He only appears once Teinaava has told you the story of how he, Scar-Tail, and Ocheeva grew up together and how Scar-Tail betrayed the friendship: "When Ocheeva and I trained with the Dark Brotherhood as children, we befriended another initiate, a Shadowscale by the name of Scar-Tail. The three of us were inseperable [sic]. When our training was completed, we reluctantly parted ways. But now... Now, the unthinkable has happened! Scar-Tail has fled Black Marsh and refuses to fulfill his duties as royal assassin! This is an act of treason! This treachery must be punished! Just as a member of the Dark Brotherhood cannot kill a fellow family member, a Shadowscale is forbidden from slaying another Shadowscale. That is why you must go to Bogwater and eliminate that treacherous snake! Please kill Scar-Tail, so Ocheeva and I can put this matter behind us." 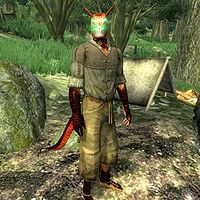 If you speak to Ocheeva about him, she will also reveal her distaste of the traitorous assassin: "Scar-Tail is a traitor to Argonia, and a blight upon Tamriel! Kill him, as my brother requests, and we will be forever in your debt." You will find him at Bogwater, never even eating or sleeping, nervously awaiting what he knows is in store for him. When you meet him, Scar-Tail isn't surprised that you managed to track him down: "I guess I've been expecting you, assassin. Don't try to deny it. I can see it in your eyes. You're Dark Brotherhood through and through. Let me guess, it was Ocheeva, right? No, wait. Teinaava. Yes, he put you up to this, didn't he. Ocheeva was always too busy to even be bothered. Well, you can kill me if you like. I'm afraid I won't make much of a challenge, though. The Argonian Royal Court already sent an Agent to do the job. He failed, of course. His body's around here somewhere. But he got in a pretty good hit. If I don't get some rest I'm probably dead anyway. So maybe I can appeal to your sense of good will, huh? Ha ha ha ha! You let me live, and I'll tell you where I stashed my treasure. Is it a deal?" Scar-Tail's life rests in your hands now. If you decide to kill him, he will attack and shout, "Ha! I expected as much from a Dark Brotherhood lapdog! I may not survive this fight, but I'll not make it easy for you!" If, however, you decide to spare his life, he will say, "You show unexpected mercy. For that I am thankful. My treasure is hidden in a hollowed-out rock near my campfire. It's yours." As for his heart, Scar-Tail will tell you "Oh yes, I suppose Teinaava wants proof that I'm dead, eh? Let me guess -- my heart? I suggest you take the heart of the dead Argonian Agent. His body is around here somewhere. Present the Agent's heart to Teinaava as proof, and he'll be none the wiser." Speaking to him again will result in, "I need to rest now, regain my strength. Don't forget to take the heart of the Argonian Agent. Present that to Teinaava, and he'll be none the wiser." Regardless of the way the quest plays out, Teinaava and Ocheeva are glad to see the end of him. Teinaava says "Scar-Tail was once as a brother to me and Ocheeva. But his act of treason destroyed any vestige of that relationship. His death was well-deserved!" Ocheeva concurs: "Scar-Tail now lies with the worms of Bogwater, thanks to you. I am forever indebted to you, Brother/Sister." He wields an iron longsword and wears a burlap vest, a pair of sack cloth pants, and matching sandals. He carries a small amount of gold. You can also cut out his heart, which can be used during the related quest. If left alive, Scar-Tail will stay in Bogwater forever. If killed, his body will disappear when the cell resets. Esta página foi modificada pela última vez à(s) 22h07min de 20 de maio de 2015.